Mupirocin is widely used for nasal decolonization of Staphylococcus aureus to prevent subsequent staphylococcal infection in patients and healthcare personnel. However, the prolonged and unrestricted use has led to the emergence of mupirocin-resistant (mupR) S. aureus. The aim of this systematic review was to investigate the prevalence, phenotypic and molecular characteristics, and geographic spread of mupR S. aureus in Africa. We examined five electronic databases (EBSCOhost, Google Scholar, ISI Web of Science, MEDLINE, and Scopus) for relevant English articles on screening for mupR S. aureus from various samples in Africa. In addition, we performed random effects meta-analysis of proportions to determine the pooled prevalence of mupR S. aureus in Africa. The search was conducted until 3 August 2016. We identified 43 eligible studies of which 11 (26%) were obtained only through Google Scholar. Most of the eligible studies (28/43; 65%) were conducted in Nigeria (10/43; 23%), Egypt (7/43; 16%), South Africa (6/43; 14%) and Tunisia (5/43; 12%). Overall, screening for mupR S. aureus was described in only 12 of 54 (22%) African countries. The disk diffusion method was the widely used technique (67%; 29/43) for the detection of mupR S. aureus in Africa. The mupA-positive S. aureus isolates were identified in five studies conducted in Egypt (n = 2), South Africa (n = 2), and Nigeria (n = 1). Low-level resistance (LmupR) and high-level resistance (HmupR) were both reported in six human studies from South Africa (n = 3), Egypt (n = 2) and Libya (n = 1). Data on mupR-MRSA was available in 11 studies from five countries, including Egypt, Ghana, Libya, Nigeria and South Africa. The pooled prevalence (based on 11 human studies) of mupR S. aureus in Africa was 14% (95% CI =6.8 to 23.2%). The proportion of mupA-positive S. aureus in Africa ranged between 0.5 and 8%. Furthermore, the frequency of S. aureus isolates that exhibited LmupR, HmupR and mupR-MRSA in Africa were 4 and 47%, 0.5 and 38%, 5 and 50%, respectively. The prevalence of mupR S. aureus in Africa (14%) is worrisome and there is a need for data on administration and use of mupirocin. The disk diffusion method which is widely utilized in Africa could be an important method for the screening and identification of mupR S. aureus. Moreover, we advocate for surveillance studies with appropriate guidelines for screening mupR S. aureus in Africa. Staphylococcus aureus is a well-recognized human pathogen that is implicated in a wide array of superficial, invasive and toxigenic infections . 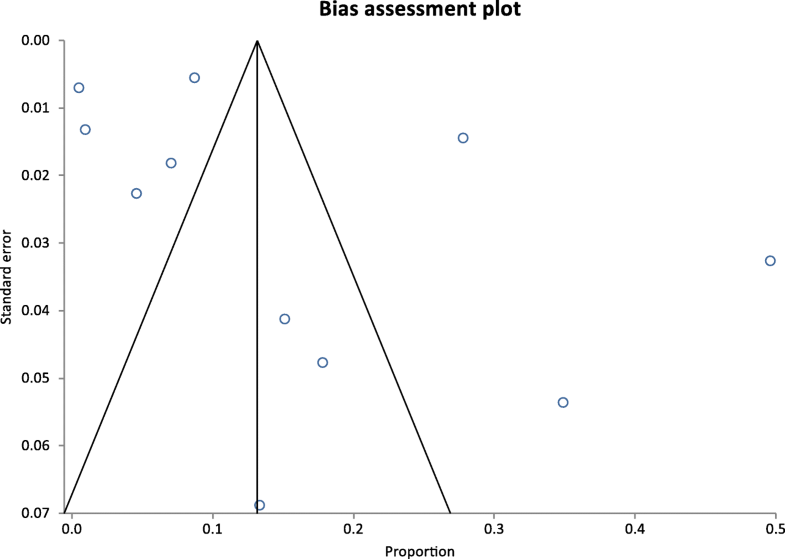 Meta-analyses of published studies have provided evidence that S. aureus nasal carriage is an important risk factor for subsequent infection among patients with surgical site infections and atopic dermatitis [2, 3]. Other high-risk groups include patients colonized with methicillin-resistant Staphylococcus aureus (MRSA) undergoing dialysis, and patients admitted in the intensive care unit [4, 5]. Consequently, infection prevention strategies such as nasal decolonization are employed to minimize the occurrence of staphylococcal infection and reduce the risk of transmission in healthcare settings [6, 7]. Mupirocin (2%) nasal ointment alone or in combination with 4% chlorhexidine (CHG) based body wash is considered as the main decolonization strategy for S. aureus carriage [8, 9]. Mupirocin is a naturally occurring antibiotic produced by Pseudomonas fluorescens that interferes with protein synthesis by competitive inhibition of the bacterial isoleucyl-tRNA synthetase (IRS) [10, 11]. It gained prominence in the mid-1990s for the eradication of S. aureus nasal carriage due to its effectiveness, safety and cost . Mupirocin-resistant (mupR) S. aureus was first reported in the United Kingdom in 1987 . Since then, it has been reported in several countries worldwide [14–17]. The emergence of mupR S. aureus has been associated with unrestricted policies and use of mupirocin for long periods in health care settings [8, 18]. Decolonization failure in patients with S. aureus carriage is associated with high-level mupirocin resistance (HmupR - minimum inhibitory concentration [MIC]: ≥512 μg/ml), while that of low-level mupirocin resistance (LmupR – MIC: 8-64 μg/ml) is still unclear [7, 19]. LmupR is mediated through point mutation (largely V588F and V631F) in the native isoleucyl-tRNA synthetase (ileS) gene . In contrast, HmupR is mainly attributed to the acquisition of plasmids with the mupA (or ileS2) gene encoding an additional IRS with no affinity for mupirocin [11, 21]. Another determinant for HmupR is the acquisition of a plasmid-mediated mupB gene . There is no data summarizing reports on screening, prevalence, characterization, and geographic spread of mupR S. aureus in Africa. This systematic review evaluated published articles that assessed for mupirocin resistance in African S. aureus isolates. The findings from this systematic review highlight the need to develop an early warning system, including harmonized strategies for the prompt screening and identification of mupR S. aureus in Africa. The relevant English articles from human and animal investigations were retrieved by three authors (YA, SA, and AS) from five electronic databases (EBSCOhost, Google Scholar, ISI Web of Science, MEDLINE, and Scopus). The search terms for each database are reported in Table 1. The literature search was concluded on 3 August 2016. 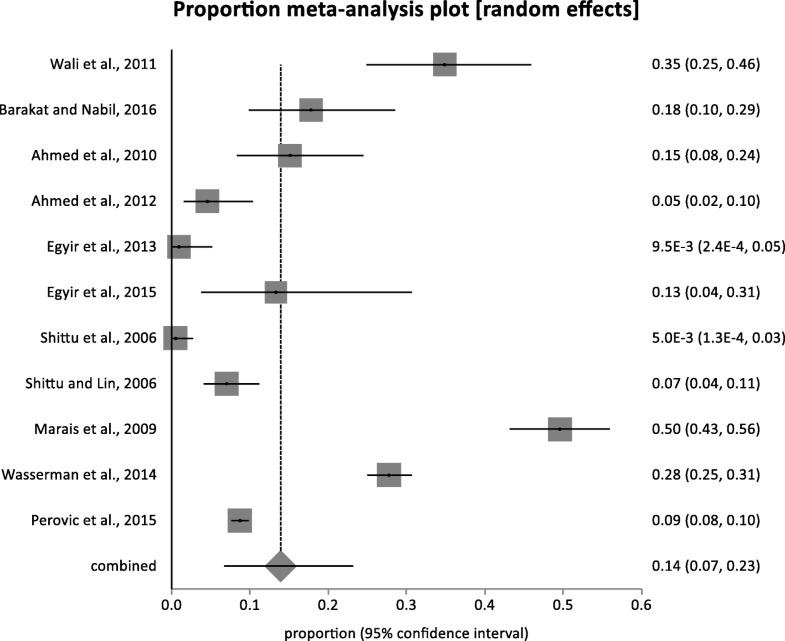 The identification of the eligible articles was conducted according to the guidelines for preferred reporting items for systematic reviews and meta-analyses (PRISMA) . We defined an eligible article as a peer-reviewed publication that (i) included mupirocin in the antibiotic susceptibility testing of S. aureus isolates, and (ii) employed phenotypic ((disc diffusion, E-test, minimum inhibitory concentration (MIC), VITEK and other automated methods)), and/or molecular ((conventional or real-time polymerase chain reaction (PCR)) techniques. International multicentre studies that included African countries were also eligible for inclusion. *Separate reports that analyzed the same isolates but answered different questions (considered as one single study) in Nigeria; **: Separate reports that analyzed the same isolates but answered different questions (considered as one single study) in South Africa. 1. Jorgenson JH, Turnidge JD, Washington JA. Dilution and disc diffusion method. In: Murray PR, Baron EJ, Pfaller MA, Tenover FC, Yolken RH, editors. Manual of Clinical Microbiology, 7th edition. American Society for Microbiology, Washington DC, 1999. p. 1526–1543. Adapted from NCCLS: National Committee for Clinical Laboratory Standards 1997. Approved Standard M2-A6; National Committee for Clinical Laboratory Standards 1999. Approved Standard M100-S9. 2. Kresken M, Hafner D, Schmitz FJ, Wichelhaus TA. Prevalence of mupirocin resistance in clinical isolates of Staphylococcus aureus and Staphylococcus epidermidis. Results of the antimicrobial resistance surveillance study of the Paul-Ehrlich Society for Chemotherapy, 2001. Int J Antimicrob Agents, 2004, 23:577–81. The widely accepted breakpoints: ≤4 mg/l (susceptible), 8–256 mg/l (low-level resistance) and ≥ 512 mg/l (high-level resistance) was utilized in this study. 3. Udo EE, Farook VS, Mokadas EM, Jacob LE, Sanyal SC. Molecular fingerprinting of mupirocin-resistant methicillin-resistant Staphylococcus aureus from a burn unit. Int J Infect Dis, 1999,3:82–7. Growth within a 14-mm zone of inhibition with the 5 μg mupirocin disk detected low-level resistance, while growth to the edge of the 200 μg mupirocin disk indicated high-level resistance. 4. Udo EE, Al-Sweih N, Mokaddas E, Johny M, Dhar R, Gomaa HH, Al-Obaid I, Rotimi VO. Antibacterial resistance and their genetic location in MRSA isolated in Kuwait hospitals, 1994–2004. BMC Infect Dis, 2006;6:168. The widely accepted breakpoints:≤4 mg/l (susceptible), 8–256 mg/l (low-level resistance) and ≥ 512 mg/l (high-level resistance) was utilized in this study. Thirdly, to estimate the prevalence of mupR S. aureus in humans, studies that employed at least one of the screening methods with defined breakpoint for mupirocin resistance were included in the meta-analysis. The StatsDirect statistical software version 3.0.165 (England: StatsDirectLtd.2016) was utilized to assess the heterogeneity of the eligible studies included in the meta-analysis (Cochran Q-test) , and to ascertain the inconsistency across the studies (I2 statistic) . The random effects model was used to determine the pooled prevalence of mupR S. aureus in Africa. The criterion for statistical significance for heterogeneity was set at alpha = 0.05. The risk of publication bias was assessed and visualized by a Funnel plot [26, 27]. We identified 43 reports (Table 1) of which 34 studies investigated only human samples. The remaining nine studies assessed samples from only animals (n = 5), human and environmental sources (n = 2), human and animal sources (n = 1), and cockroaches (n = 1). Most of the eligible studies (32/43; 74%) were obtained from EBSCOhost, ISI Web of Science, MEDLINE, and Scopus. The remaining studies (11/43; 26%) were obtained only through Google Scholar and consisted of studies conducted in Egypt [28–31], South Africa [32–34], Nigeria [35, 36], Ethiopia  and Kenya . Only 12 of the 54 (22%) African countries reported data on screening for mupR S. aureus (Fig. 2). The first published article indicated that mupirocin had been in use in Africa, at least from the late 1980s . Most of these studies (28/43; 65%) were conducted in Nigeria (10/43; 23%), Egypt (7/43; 16%), South Africa (6/43; 14%) and Tunisia (5/43; 12%) (Fig. 2). MupR S. aureus was mainly identified through the disk diffusion method (29/43; 67%). The guidelines by the Clinical and Laboratory Standards Institute (CLSI), previously known as National Committee for Clinical Laboratory Standards (NCCLS), were broadly used in Africa (Table 2). However, a number of studies [28, 29, 31, 33, 36, 40–46] utilized the disk diffusion method with CLSI guidelines that had no zone diameter breakpoint for mupirocin. Moreover, some studies [47–49] did not provide information on the year of publication of the CLSI guidelines. 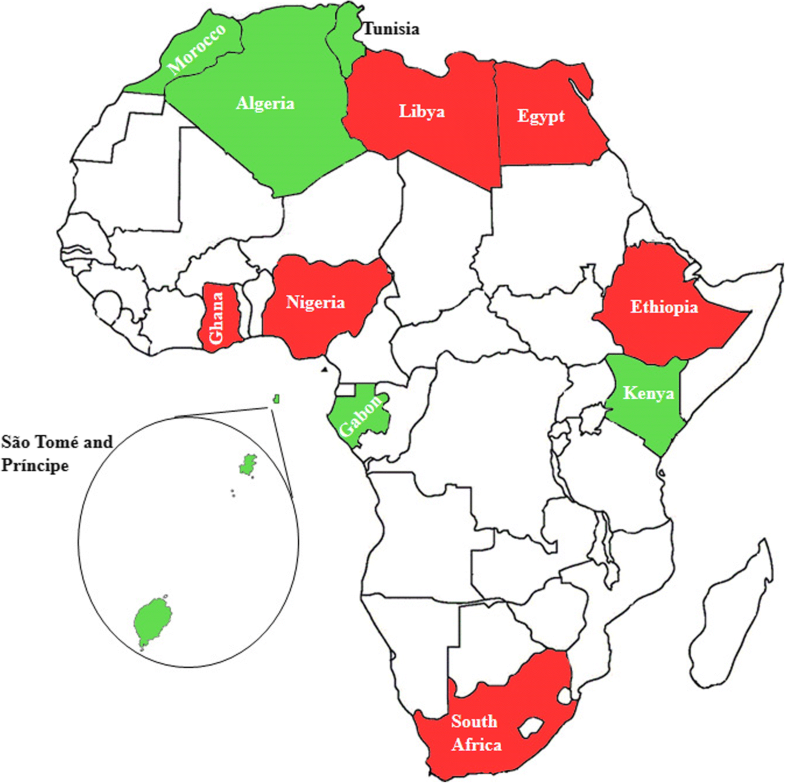 MupR S. aureus was reported in six African countries including South Africa [32–34, 46, 50, 51], Egypt [29–31, 52], Nigeria [36, 44, 53], Ghana [54, 55], Libya [56, 57] and Ethiopia  (Fig. 2; Table 2). The mupA-positive S. aureus was detected in five studies from Egypt [30, 52], South Africa [33, 50] and Nigeria . LmupR and HmupR were both reported in six human studies conducted in South Africa [32, 33, 50], Egypt [30, 52] and Libya . The mupR-MRSA isolates were identified in South Africa [32, 34, 50, 51], Egypt [30, 31, 52], Libya [56, 57], Ghana  and Nigeria  (Table 3). MupR-MRSA was not reported from MRSA isolates recovered from studies conducted in Egypt [28, 58], Tunisia [59, 60] and Algeria . An assessment of data on mupR S. aureus at the regional level is described as follows (Fig. 3). Seventeen eligible studies were recorded from this region, including Egypt [28–31, 40, 52, 58], Tunisia [41–43, 59, 60], Libya [56, 57, 61], Algeria  and Morocco . MupR S. aureus was reported in six studies conducted in two North African countries: Egypt [29–31, 52] and Libya [56, 57]. PCR detection of the mupA gene was performed in only two studies conducted in Egypt [30, 52]. In addition, one of the reports identified two mupA positive MRSA that exhibited LmupR . MupR S. aureus was not detected in Tunisia [41–43, 59, 60], Algeria , and Morocco . S. aureus resistance to mupirocin was investigated in Nigeria [35, 36, 44, 48, 49, 53, 63–66] and Ghana [54, 55, 67, 68]. Only two studies from Ghana reported on mupR S. aureus [54, 55]. In Nigeria, three studies (including two from only human sources and one from both animal and human samples, respectively) reported on S. aureus isolates that demonstrated HmupR [36, 44, 53]. MupR S. aureus was not detected in studies conducted in Gabon , and São Tomé and Príncipe . In this review, we identified four eligible studies conducted in Kenya [38, 71, 72] and Ethiopia . A report on the role of cockroaches as potential vectors of foodborne pathogens in Ethiopia identified 17 mupR S. aureus isolates . All the S. aureus isolates (one animal and two human studies) from Kenya were susceptible to mupirocin [38, 71, 72]. The six studies reported in this geographical area were from South Africa and consisted of two single centre studies [34, 46] and four multicenter studies [32, 33, 50, 51]. MupR S. aureus was identified in all the reports, while mupA-positive S. aureus isolates were noted in only two studies [33, 50]. The random-effects pooled prevalence of mupR S. aureus in Africa is 14% (95% CI =6.8 to 23.2%). This was calculated based on 11 heterogeneous human studies (Figs. 4 and 5) conducted in South Africa [32, 33, 50, 51], Ghana [54, 55], Egypt [30, 52], Libya [56, 57] and Nigeria . In Africa, the proportion of S. aureus isolates with the mupA gene, and those that expressed LmupR and HmupR ranged between 0.5 and 8%, 4 and 47%, 0.5 and 38%, respectively. The frequency of mupR-MRSA isolates ranged between 5 and 50% (Table 3). There is no data on the use of mupirocin as an agent for S. aureus decolonization and its association with mupR S. aureus in Africa. A report from Egypt noted that mupR-MRSA were moderate to strong biofilm producers . In this systematic review, two studies (conducted in Egypt and South Africa) showed that mupR S. aureus was associated with multi-drug resistance [30, 33]. Only three studies provided molecular data on mupR S. aureus in Africa [45, 54, 55]. A report provided evidence of a 35 kb (non-conjugative) and 41.1 kb (conjugative) plasmid encoding mupA in S. aureus isolates from Nigeria and South Africa . It also described an MRSA clone that demonstrated LmupR in South Africa. LmupR was also identified among MRSA isolates assigned with ST36, ST88, and ST789 in Ghana . A cross-sectional S. aureus study identified a methicillin susceptible S. aureus (MSSA) strain with HmupR from a 51-year-old hospital staff in Ghana . Molecular characterization indicated that the strain (spa type t4805) was PVL-positive. This is the first systematic review on mupR S. aureus in Africa and clearly showed the paucity of data on the continent. Nevertheless, this study indicated a high prevalence ((14% (95% CI =6.8 to 23.2)) of mupR S. aureus in Africa. These observations support the need for mupR S. aureus surveillance data to provide information on its epidemiology and clinical significance in Africa. It is noteworthy that Google Scholar was valuable in the identification of several eligible studies [28–38]. We observed that 26% (11/43) of the eligible studies were identified from African journals which were not indexed in commonly used electronic databases. 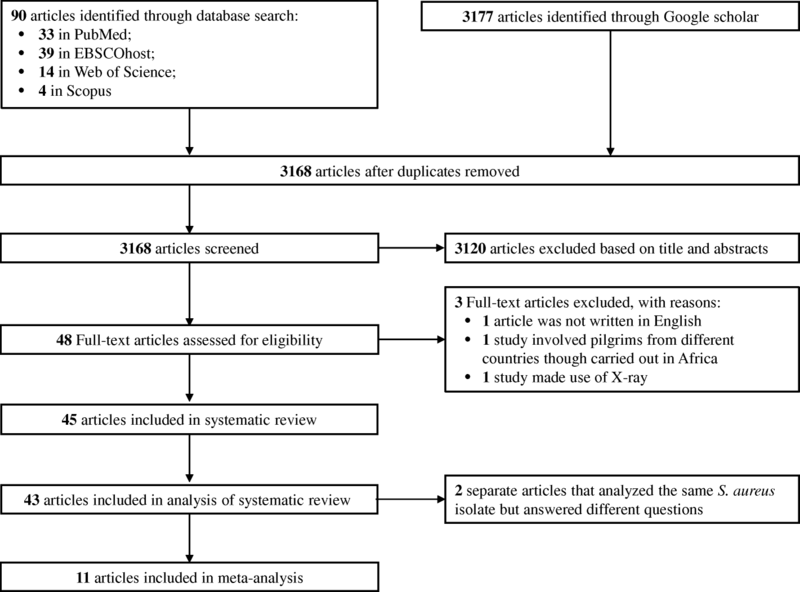 Google Scholar has been considered as a useful supplement with other electronic databases for systematic review search  including recent meta-analyses of published studies on S. aureus in Africa [74, 75]. The phenotypic methods for the screening and identification of mupR S. aureus include disc diffusion (two-disc strategy: 5 μg and 200 μg), agar dilution, broth micro-dilution and E-test . In this study, the disk diffusion method and the CLSI (formerly NCCLS) guidelines were strategies mainly applied to detect mupR S. aureus in Africa. However, we observed certain inconsistencies [28, 29, 31, 33, 36, 40–49]. For instance, a number of studies [28, 29, 31, 33, 36, 40–42, 44–46] applied the disk diffusion method with the CLSI guidelines that had no breakpoint values for mupirocin. The 2017 CLSI guidelines recommend the use of the 200 μg disk to differentiate between HmupR and the absence of HmupR (i.e. no zone = HmupR; any zone = absence of HmupR) . The 200 μg disk with a different breakpoint (Susceptible ≥30 mm, Resistance < 18 mm) is also endorsed for the differentiation between HmupR and the absence of HmupR in the latest versions (accessed 28th May, 2018) of the European Committee for Antimicrobial Susceptibility Testing (EUCAST) and Comité de l’antibiogramme de la Société Française de Microbiologie (CA-SFM) [77, 78]. The breakpoint values for the detection of LmupR and differentiation from HmupR are not provided in these documents (CA-SFM, CLSI, and EUCAST). Despite this limitation, the disk diffusion method in conjunction with any of these guidelines could at least be valuable for the preliminary screening and identification of HmupR S. aureus in Africa. MRSA decolonization failure is of clinical significance as it is often attributed to persistence or re-colonization associated with isolates exhibiting HmupR, while that of LmupR is not clear [7, 19, 79]. In this review, the prevalence of S. aureus that exhibited LmupR, HmupR and mupR-MRSA in Africa was predicated on a range of methods using different guidelines. We suggest that surveillance data from Africa is established on harmonized guidelines to enhance quality assurance and comparison at the continental and global level. We noted a prevalence of mupR-MRSA ranging between 5 and 50% in Africa (Table 3). This is of serious concern. Specifically, the relationship between mupirocin resistance and MRSA has important consequences on infection control measures and effectiveness of decolonization strategies . MupR-MRSA could limit the choices available for the control and prevention of healthcare-associated MRSA infections (7, 8). Therefore, surveillance studies are important to investigate the emergence and spread of mupirocin resistance in hospital settings in Africa. This is important among patients at high risk of MRSA infections, including patients in the dermatology, dialysis and the Intensive Care Units. In addition, there is the need for more data on the molecular characterization of mupR S. aureus in Africa [45, 54, 55]. For instance, whole genome sequencing (WGS) will assist in understanding the transmission dynamics of mupR S. aureus in Africa. Moreover, WGS data will allow comprehensive investigation of the genetic basis for LmupR mutation (which is largely due to V588F and V631F in the native gene (ileS)) and mupB-positive S. aureus in Africa. Language bias was the main limitation of this systematic review as we did not include studies published in French, Portuguese, Arabic and Spanish. This study showed the need for more epidemiological data to understand the transmission, burden and risk factors associated with mupR S. aureus in Africa. In addition, there is a need for data on administration and use of mupirocin in community and hospital setting in Africa. This is important in antibiotic stewardship to mitigate the emergence and spread of mupR S. aureus in Africa. Finally, this systematic review highlighted the need for harmonized guidelines to facilitate the comparison of data on mupR S. aureus from Africa. SMA was supported by the Organization for Women in Science in the Developing World (OWSD). AOS received funding through the Deutscher Akademischer Austausch Dienst (DAAD award) Staff Exchange Programme (2016). MK was a Wellcome Trust (UK) Fellow (102429/Z/13/Z). His research is currently supported by the Carnegie Corporation of New York (USA) early-career fellowship, the CIHR CTN International Fellowship (Canada), and the US National Institutes of Health (1R01HD093578-01). We appreciate the kind assistance of Oluwafemi Daramola in the preparation of the manuscript. This review received support through the Deutscher Akademischer Austausch Dienst (DAAD award) Staff Exchange Programme (2016). However, the opinions expressed in this review are that of the authors. All supporting materials (Figures and Tables) are included in the manuscript. AOS conceived the project. YOA, SMA and AOS extracted the data and reviewed the articles. MOA and AOO wrote the initial draft of the manuscript. AOS, SMA, YOA, and MK wrote the subsequent draft. All the authors reviewed and agreed on the final version of the manuscript before submission for publication. Global Guidelines for the prevention of surgical site infection. World Health Organization, Geneva. 2016. http://www.who.int/gpsc/ssi-prevention-guidelines/en/ Accessed 15 June 2017. Melake N, Zakaria AS, Ibrahim NH, Salama M, Mahmoud AZ. Prevalence of agr specificity groups among in vitro biofilm forming methicillin resistant Staphylococcus aureus strains isolated from nasal carriers. Int J Microbiol Res. 2014;5:76–84. https://doi.org/10.5829/idosi.ijmr.2014.5.2.83184. Okon KO, Basset P, Uba A, Lin J, Oyawoye B, Shittu AO, Blanc DS. Co-occurrence of predominant Panton-Valentine Leukocidin-positive sequence type (ST) 152 and multidrug-resistant ST 241 Staphylococcus aureus clones in Nigerian hospitals. J Clin Microbiol. 2009;47:3000–3. https://doi.org/10.1128/JCM.01119-09. Enany S, Yaoita E, Yoshida Y, Enany M, Yamamoto T. Molecular characterization of Panton-Valentine Leukocidin-positive community-acquired methicillin-resistant Staphylococcus aureus isolates in Egypt. Microbiol Res. 2010;165:152–62. https://doi.org/10.1016/j.micres.2009.03.005. Ben Nejma MB, Mastouri M, Jrad BBH, Nour M. Characterization of ST80 Panton-Valentine Leukocidin-positive community-acquired methicillin-resistant Staphylococcus aureus clone in Tunisia. Diagn Microbiol Infect Dis. 2013;77:20–4. https://doi.org/10.1016/j.diagmicrobio.2008.02.010. Souly K, Ait el Kadi M, Lhmadi K, Biougnach H, Boughaidi A, Zouhdi M, Benasila S, Elyoussefi Z, Bouattar T, Zbiti N, Skalli Z, Rhou H, Ouzeddoun N, Bayahia R, Benamar L. Epidemiology and prevention of Staphylococcus aureus nasal carriage in hemodialyzed patients. Med Mal Infect. 2011;41:469–74. https://doi.org/10.1016/j.medmal.2011.05.005. Shittu AO, Okon K, Adesida S, Oyedara O, Witte W, Strommenger B, Layer F, Nübel U. Antibiotic resistance and molecular epidemiology of Staphylococcus aureus in Nigeria. BMC Microbiol. 2011;11:92. https://doi.org/10.1186/1471-2180-11-92. Ayepola OO, Olasupo NA, Egwari LO, Becker K, Schaumburg F. Molecular characterization and antimicrobial susceptibility of Staphylococcus aureus isolates from clinical infection and asymptomatic carriers in Southwest Nigeria. PLoS One. 2015;10:e0137531. https://doi.org/10.1371/journal.pone.0137531. The European Committee on Antimicrobial Susceptibility Testing. Breakpoint tables for interpretation of MICs and zone diameters. Version 8.1, 2018. http://www.eucast.org. Accessed 28th May, 2018. Comite de l’antibiogramme de la Societe Francaise de Microbiologie – recommendations 2018 v.1.0 mai. http://www.sfm-microbiologie.org. Accessed 28th May, 2018.